The Poson Full-moon Day is significant to the Sri Lankans as the day on which the Arahat Mahinda, Emperor Asoka’s son, introduced Buddha Dhamma to the nation in the 3rd century B.C. Arhant Thero Mahinda converted the ruler, King Devanampiya Tissa to Buddha Dhamma, and set in motion a series of measures that made Sri Lanka the centre of Theravada Buddhism. The Missaka Pavva Mihintale, where the historic encounter between the Arhant and the monarch took place receives the reverential interest of the devotees on Poson Poya day. King Devanampiya Tissa was a ‘Pen- friend’ of emperor Dharmasoka, who exchanged gifts through messengers. In a letter message to king Devampiya Tissa by the Emperor Dharmasoka a mention had been made about an invaluable gift he could present. The king was anxious to know the detail and was contemplating on the supreme treasure in it. Poson Full Moon Day was famous as the day of sports in Lanka, prior to the advent of Buddhism. King Devanampiya Tissa accompanied by his men, engaged himself in a game of tracking deer in the royal park on this lovely day with fine weather. A sturdy deer ran speedily by the king’s side. The king got into action, he had no time to spare as the king himself was to attack the muscular deer. He draw out a dart and aimed at the animal, but his arrow did not go. As the monarch stood at the foot of the hill, a beam of light radiated from the top of the mountain. Surprised, that his name being called in a profound voice, the king was particularly concerned as to who in the kingdom dared to call him Tissa— his name. Added to the misery, he was sorry that he missed his target. However, he was not annoyed as the language was pleasant. The mountainous abode of hoofed animals, such as sambre, elk and deer, Mihintale, was an ideal hunting place for the king. The meeting of King Devanampiya Tissa and Arahath Mihinda Thera took place exactly where the Ambatthala dagoba is now located. The king gazed up standing dumb founded at the foot of a Mango tree and saw the fascinating figure of Arhant Mahinda in yellow robes and he could not take away his eyes from this amazing scene. Four more arahants, a samanera [junior monk] and the upasaka [devotee] too appeared one by one. Arahath Mahinda performed an IQ test on the King with a series of questions which was believed to be the first of its kind documented in the history. Following it, Mahinda Thero delivered the ‘Chulla Hasti Padopama Sutra’ to convince the King that the profound Dhamma of the Buddha could be understood only through one’s own endeavors, and not by relying on what someone says. The Sutra emphasizes that one must not judge the size and variety of an pachyderm by the dimensions of its foot prints; which is not the only criterion to establish the nature of the giant animal. Once a Brahmin named Janussoni, met ascetic Pilothika, and argued about the profundity of the Buddha. Pilothika said Buddha, the fully enlightened one was prominent, dignified and unique among humans and extraterrestrial beings. He emphasised that only another Buddha could review the learnedness of a Buddha and that he was not capable of commenting on the attainments of the Buddha. He said that he had well promulgated his doctrine, and the Buddha only shows the path to total liberation, – and that the Dhamma was well observed by the Sangha. An elephant could be recognized only by directly watching it at the place where it lies, walk or stand. Similarly, in order to identify the Buddha, one should inevitably go to him in person. Pilothika further said he had been to the Buddha like a person who identifies the elephant of his choice, by tracking the footprints. 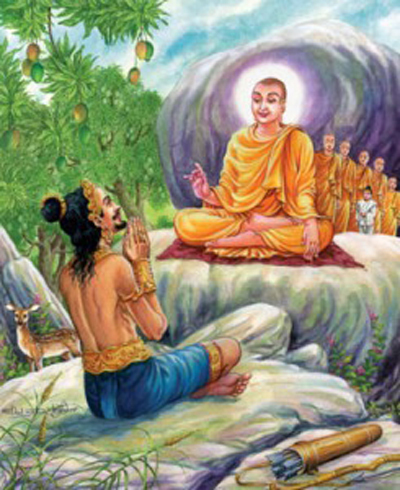 There are four decisive factors on which Pilothika had accepted the Buddha as his liberator to find the path to total emancipation; they are “gnanapada” or righteous qualities of the Buddha, namely authorities of royal race, Brahmin authorities, householder authorities and ascetic authorities. Emperor Asoka initiated Third Buddhist Council and widened the spread of Buddhism in neighbor countries around India. Mahinda Thera, the son was entrusted with the task of promulgating Dhamma in Sri Lanka, ‘Thambapani’ as it was then known. 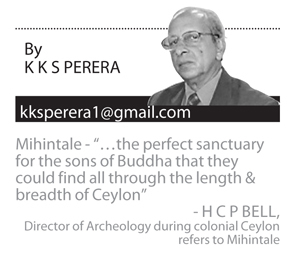 He arrived in 236 BC for the establishment of Buddhism on Poson Poya Day, an event that turned round our history. The Buddha Dhamma introduced by him has survived for over two and a half centuries. Mahinda Thera spent time studying the situation that prevailed in Sri Lanka before taking up the mission; he patiently killed time until waiting for the appropriate time to launch his assignment. Mahavamsa says, King Mutasiva 307-250 BC was too old and feeble that he may not be able to handle the task of achieving such a enormous task. The Yaksha clan and worship of the sun and other deities; the cults, rituals had to a great extent declined with King Vijaya who was a Hindu. Mihindu thera overcame all challenges he faced during his mission in Sri Lanka. However soon he recieved unstinted support from the king and the people. The Buddha had sermonized the Dhamma clearly and manifestly. He made it clear and to the point. People who go to the Buddha to get his problems resolved or deliberately, with the objective of arguing with him, would listen to the enlightened one, as his style and approach was pleasing, gracious and harmonious. The message of Mihindu Thera exemplifies that Buddhism does not ignore the material and worldly characteristics of life; but considers religious values are more sacred than material values. The message of Dhamma sets out certain norms of conduct for rulers as well as subjects. Buddha spelt out his preference for democratic form while commenting on different types of governments existed in India at the time. Hindu ideas of government during Buddha’s time were based on the theory of ‘Matsya Niyaya’, or Law of the Jungle, that ‘The strong would devour the weak’, like fishes in water, if not proscribed by an authority. It further says that administration, rulers and laws are essential to prevent this Matsya Niyaya.